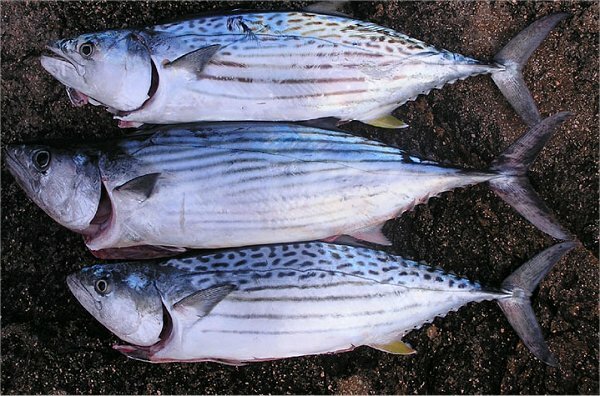 Bonito can be caught by trolling a small lure just offshore and around offshore reefs. Bonito respond to the same techniques which take skipjack and mackerel tuna, and also fall for those employed to target salmon, tailor and kingfish. Boat anglers sometimes take good hauls by trolling diving minnows parallel with the shoreline, close to headlands and rock ledges, or by casting and retrieving lures around "washes" of broken white-water adjacent to these areas. Land-based anglers also do well at times by casting and retrieving lures from the ocean rocks, jetties and breakwalls. In addition to lures and flies, bonito will attack pilchards and garfish rigged on ganged hooks, as well as live baits and strip baits or cubes of fish flesh , especially when these are free-lined in a berley trail. Other Lures: High speed chrome baitfish lures, chrome spoons, slugs, flathead jigs and plastic squid for trolling and metal lures such as Juro Shiners and Halco Hex slices work for spinning. Saltwater flies such as Clousers and Deceivers. Current Pacific Bonito All Tackle Record (IGFA) 21 lbs. 5 ounces. Current Atlantic Bonito All Tackle Record (IGFA) 18 lbs. 4 ounces.